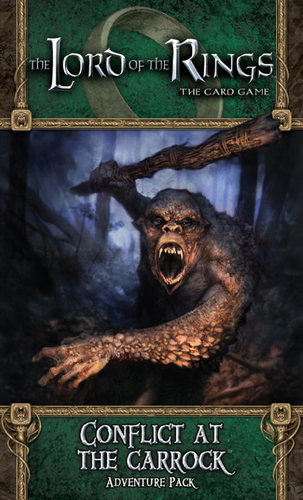 Second in the Shadows of Mirkwood series of adventure packs, Conflict at the Carrock packs a serious punch, with a difficulty rating of 7 (the same as the final adventure in the original set). Where The Hunt for Gollum sees players dealing with a very location-heavy deck, this time round the focus is very much on the fighting, culminating in a tense battle, as four trolls challenge the heroes. Firstly, the scenario itself while certainly hard is by no means impossible, and lends itself to multiple strategies. Given the prominent role fighting the trolls plays, there’s a lot of tension here. Aside from the trolls in the new deck, the hill trolls from the original game can also play an ominous cameo role. This quest can see heroes being captured, very similar to the prisoner in the “Escape from Dol Guldur” adventure in the core set, which only adds to the difficulty should a hero get ‘knocked out’ at a critical stage. An interesting addition, this is also the first adventure to feature a player ally in the enemy deck itself, who whilst very expensive, lends himself to fighting the trolls, and can be all that is needed to draw victory from the jaws of defeat. In comparison to the quest, the player cards are more of a mixed bag, though are still a better selection than in The Hunt for Gollum. The hero in this pack is Frodo Baggins, who is a decent addition to the game, with a relatively cheap starting cost and an ability that makes him virtually invincible (converting damage to threat). There are then two cards per sphere, usually an ally and an event/attachment, plus a song which generates one lore resource per turn. All but one of the cards here can find their uses even without extra cards from other adventure packs. Aside from the usual gripes which are inherent to the nature of this card game, there are a couple of minor problems with this adventure. First, it doesn’t scale quite as well as the previous one, which although it doesn’t make it unplayable, shows it was clearly designed with two players in mind. The second issue is simply a question of paying attention, but there are quite a few cards which alter the values of other ones in the game, particularly when the four trolls come into play, and it’s easy to overlook these extras. The first time we defeated this adventure, we’d actually missed the fact that our threat level should have risen and killed us, so it pays to be vigilant when reading the card text! Ultimately, Conflict at the Carrock is a very worthwhile expansion to the core game, offering a challenging and exciting new adventure, very action packed, with a selection of decent player cards. The hero, Frodo Baggins, adds some versatility to the way you play the game, whilst the addition of a player ally hidden in the enemy deck is an interesting twist, and thematically in keeping. If you like the core game and don’t insist on playing the adventure packs in order, this is one of the better ones in the Shadows of Mirkwood series.